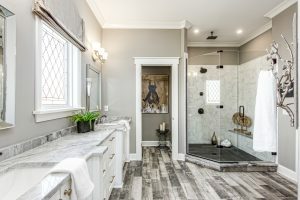 No longer the traditional and utilitarian space of yesteryear, the home bath is becoming a refined and luxurious environment, providing a lavish sanctuary for us to relax or recharge during our sometimes hectic days. Creating that perfect oasis in your own home requires the best materials and craftsmanship worthy of a luxury spa retreat. The sophistication and detail of a room’s design layout converge with beautifully styled elements and functionality for a design fully custom to your home’s needs and lifestyle. As no exception to this high standard a luxury bath’s furniture is quite the perfect illustration of these principles. That’s why Dream Baths is proud to have Dura Supreme as a custom cabinet supplier. Founded in Minnesota by Donald Stotts, Dura Supreme has over 50 years of providing homeowners and designers with custom, handcrafted cabinetry with an emphasis on excellent personalized design and outstanding quality. With a continuing dedication to work ethic and customer service the original founder’s son, Keith Stotts now leads the company as president, continuing in the company’s stated principles of quality and innovation. Dura Supreme keeps up with implementing the latest technology as well as maintaining handcrafted elements and finishes for a truly one-of-a-kind piece of furniture combining the perfect precision, quality and value. Are you ready to make your own dream bath a reality?